Several eye witnesses claimed that a thick smoke trail was following the Attakurukki mass to the ground. 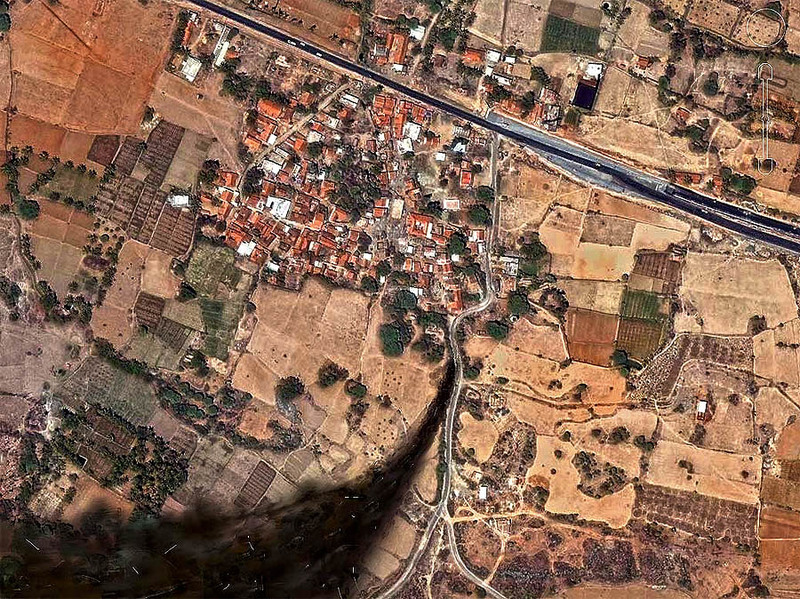 Witnesses in Kammandody, less than 3 kilometers from Attakurukki, explained, that they would not have noticed the object falling, if it would not have left a black trail behind on its way down to the surface. Although smoke trails reaching to the ground have been described by witnesses of meteorite falls before, this phenomenon is rather characteristic for larger masses, mostly irons, which sometimes retain higher velocities during their crossing of the lower atmosphere. Due to the cooling of the falling meteorites in the lower atmosphere and contrary to the general opinion, most meteorites are cold, sometimes frozen, when they hit the ground. Yet with the eye witness accounts in mind, it can not be completely ruled out that the main mass, which impacted in the village road in Attakuriki, still draw a soot trail behind it in the last stage of its flight. The artist impression above considers these eye witness accounts and attempts to capture the moment a few seconds before the impact of the main mass at the Attakurukki village road (upper right corner). One day later, on Sunday September 14, the number of known impacts climbed to four. The article by DNA India correspondent Kunal Chatterjee confirms the meteorite fall by referring to the GSI and the District Revenue Officer, N. Nagarajan as sources. 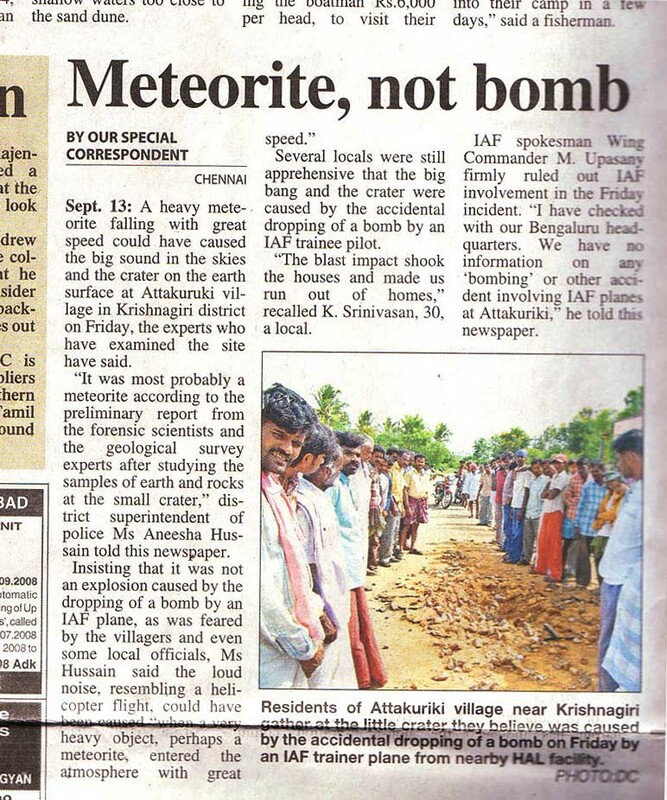 “Tremors in B’lore were due to meteorite impact. By Kunal Chatterjee. BANGALORE: The Friday morning tremors experienced by south Bangaloreans has been attributed to a meteorite shower in Hosur taluk, according to preliminary investigations conducted by a combined team of Geological Survey of India (GSI) and Forensic Science Laboratory, Chennai. The meteorites slammed into roads and agricultural fields in the two villages of Attakuruki and Kamanadody in Hosur taluk in Krishnagiri district of Tamil Nadu. On Friday morning, villagers of these sleepy villages woke up to thunderous explosions which left them numb. Krishnagiri District Revenue Officer, N Nagarajan, told the DNA that in four different locations in the two villages the meteorites left craters varying from 1.5 feet to four feet in diameter. Both the villages are about 20 Kms from Hosur. The villagers reported about seeing fiery trails descending down, dangerously close to their houses. The first printed newspaper article on the incident was published Sunday morning, September 14 in the Deccan Chronicle, Chennai. Amomg others, the correspondent of the Deccan Chronicle spoke to the district superintendent of the police, Ms. Aneesha Hussain. “Meteorite, not bomb. A heavy meteorite falling with great speed could have caused the big sound in the skies and the crater on the earth surface at Attakuruki village in Krishnagiri district on Friday, the experts who have examined the site have said. It was most probably a meteorite according to the preliminary report from the forensic scientists and the geological survey experts after studying the samples of earth and rocks at the small crater,” district superintendent of police Ms Aneesha Hussain told this newspaper. Insisting that it was not an explosion caused by the dropping of a bomb by an IAF plane, as was feared by the villagers and even some local officials, Ms Hussain said the loud noise, resembling a helicopter flight, could have been caused “when a very heavy object, perhaps a meteorite, entered the atmosphere with great speed.” Several locals were still apprehensive that the big bang and the crater were caused by the accidental dropping of a bomb by an IAF trainee pilot. With the publication of the analysis results in the data base of the Meteoritical Bulletin the Hosur meteorite shower received a new name. It is now known as the Sulagiri meteorite (Meteoritical Bulletin, no. 96, MAPS 44). The meteorite was found to be of chondritic composition and been declared a LL6 type. Fragments and nearly complete individuals totalling 110 kg were recovered from the strewnfield. Several months after the event, the Krishnagiri District website puiblished an additional report with photos of seven large specimens which were handed over to the authorities. 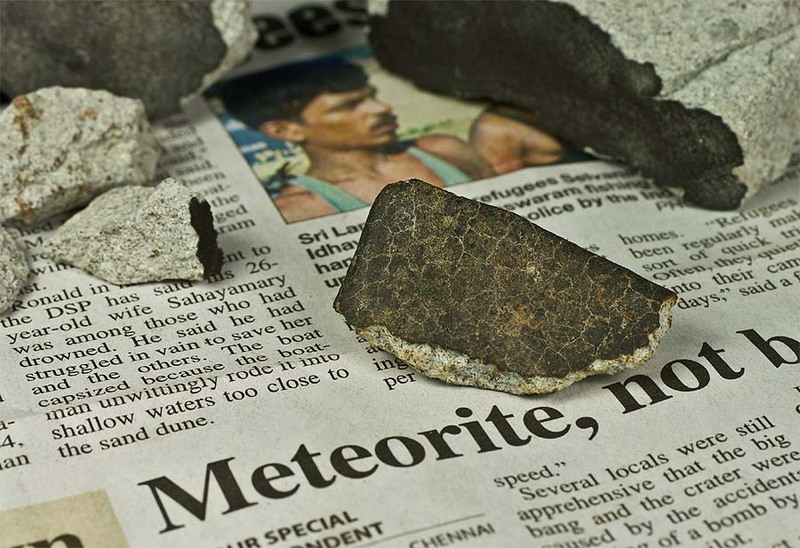 The report says “nine pieces of meteorites were recovered by the Revenue authorities of Krishnagiri District and handed over to the concerned authorities arrived from the Geological Survey of India, Chennai for further research and analysis.” The Krishnagiri District website with the meteorite feature can be viewed here.